Turkish Prime Minister Recep Tayyip Erdogan says Ankara is ready to ask NATO for a military intervention in Syria, Press TV reports. “I am ready to ask NATO for a military intervention in Syria,” Erdogan was quoted as saying on Monday. The Turkish premier made the remarks in an interview with Italian newspaper Corriere della Sera in the Slovenian capital, Ljubljana, prior to his trip to Italy. He met with Slovenian President Danilo Turk in Ljubljana on Monday. 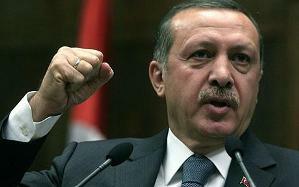 Erdogan also stated that the turmoil in Syria has to be brought to an end with the cooperation of international powers. “We have been very patient with Syria issue so far,” he claimed. The Monday remarks by the Turkish prime minister came as Syria held the first parliamentary elections under a new constitution approved by an overwhelming support of the people in a February referendum. On May 6, Erdogan also expressed Turkey’s support for the Syrians seeking refuge in Turkey during a meeting of his ruling Justice and Development Party (AKP) in the southern Turkish city of Gaziantep near the Syrian border. Over the past few months, Turkey, Saudi Arabia and Qatar expressed support for providing weaponry to the armed groups fighting against the Syrian government.